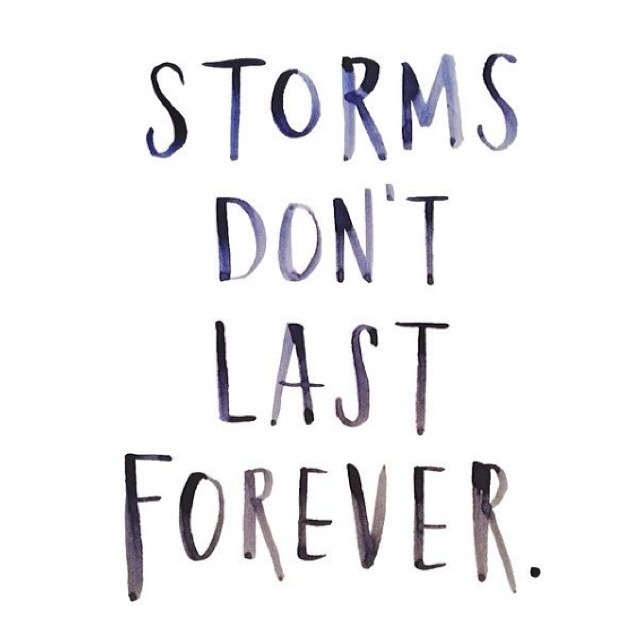 Storms don’t last forever. It’s a mantra I’ve found myself needing to think a lot lately. It’s been over 5 months since I was diagnosed but it feels like a century. When the 20th of the month hit, it felt hard to believe that I’m not even to the halfway point. Scratch that, in the grand scheme of things, I’m not even to the quarter mark. Spring 2016 feels like an eternity away. And in the middle of Summer 2014, the thought of that date gets me down. Taking it day by day is most definitely the best way to complete this challenge. But I’m not a day-by-day type of person. I love looking to the future. I’ve always been like that… looking forward to what’s next, striving for a bigger and better goal. But in this case, when the goal is so far away and there’s a lot of “mehhh” in the middle, looking to the future feels more like a daunting task rather than an exciting endeavor. I wrote this yesterday in the middle of the afternoon, sitting on my couch, basically just feeling sorry for myself. Those negative emotions are all I could think yesterday. All I could feel is how much I want my life back. However, reading it back, I feel guilty. I beat myself up when I have pitty parties for myself because it makes me feel so ungrateful and unappreciative of what I’ve been given. I’ve been given the gift of being able to fight and overcome this terrible disease. Not everyone is as lucky— that’s a thought that goes through my mind multiple times a day. I am lucky and I know it. But the truth is, I sit here today and I still ache for my old life. I still want more than anything to wake up from this bad dream and be a healthy, normal 25 year old. I try so hard to be strong but sometimes it’s just too overwhelming, too draining, too frustrating. But today’s different than yesterday. How much different? Not much. But I’m one day closer and two shades happier. Tomorrow I’ll be at the hospital all day and will be getting another bone marrow biopsy done to triple check that there are no leukemia cells in my body. So tomorrow’s a big day. It won’t be a fun day, so today had to be. Today I cooked and went to the super market and received a pair of fabulously comfy slippers from a coworker and am about to go to an outdoor yoga class which will be the first time I’ve done group exercise in over 5 months. It’s a better day than yesterday and Thursday will be a better day than tomorrow. Storms are scary. There are large cracks of thunder, lightening that illuminates the sky and sets fire to things here on earth, heavy rains that come in sideways and make you cold and wet. Often times in a storm, you even lose power. Sometimes, the lights just flicker and other times you can lose it for hours and even days. But the light always comes back on. The thunder and lightening and rain, they always stop. The clouds always break and that big beautiful sun always comes shining through. Today is milestone day. 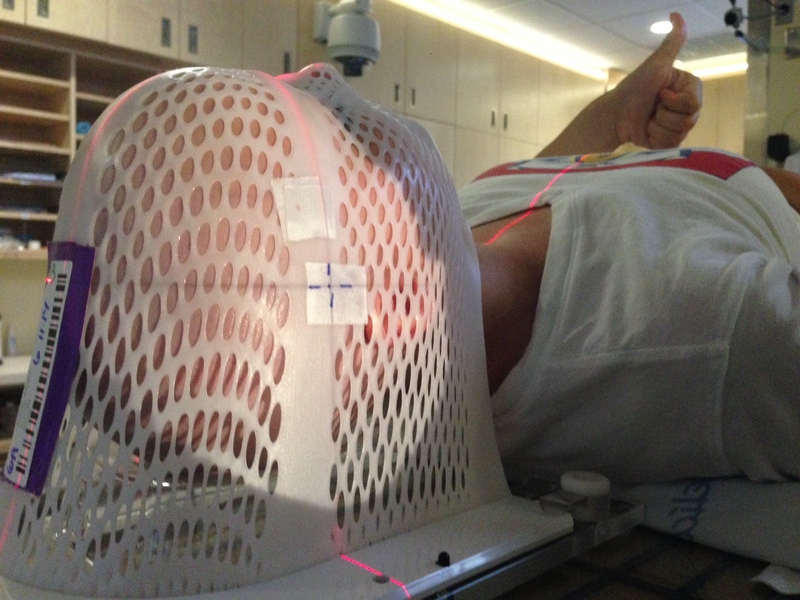 Today marks the end of my brain radiation. It was only an 8 day preventative treatment regimen but it’s another thing to check off “the list” which feels incredible. All-in-all radiation was strange. The process is pretty simple— you go in, get on the table, strap in, get zapped for a few minutes and then it’s done. 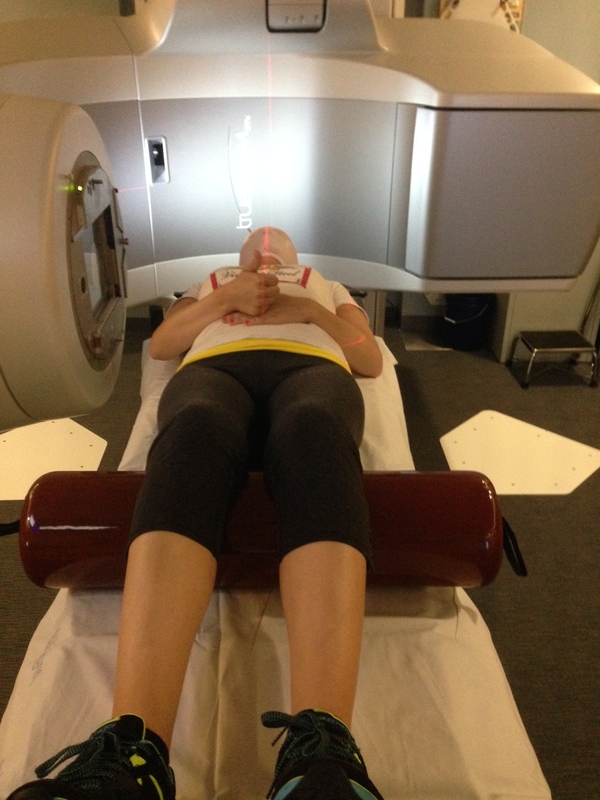 It doesn’t hurt and it’s quick, so in that regard, it’s pretty great compared to chemo. However, it’s sneaky because it makes you really exhausted which is never any fun. 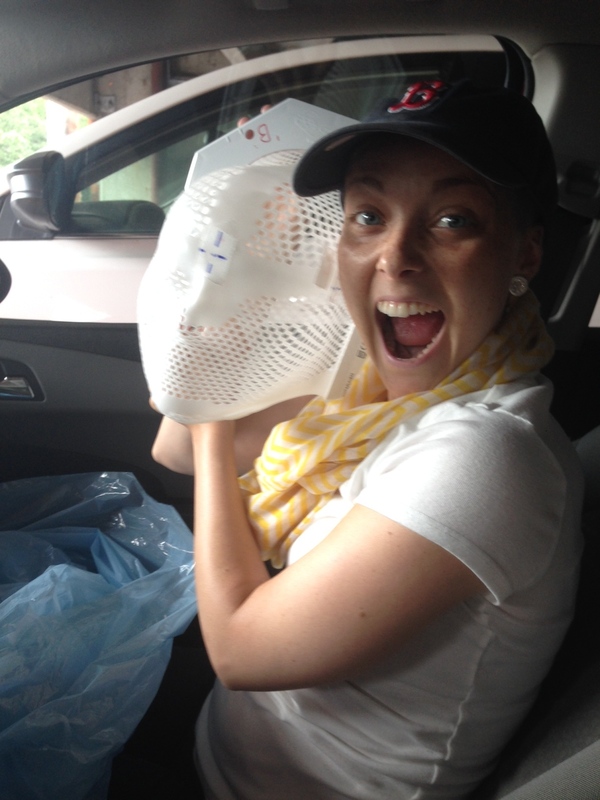 The worst part, BY FAR, was getting fitted for my mask a few weeks ago. Basically, in order to make sure that my head doesn’t move an inch during the treatment (don’t want to zap the wrong areas), you have to have a mask created specifically for your face that you wear each time. It fits tightly around your face and then locks in place so you can’t move. Definitely would not be ideal for the claustrophobic! But with the help of my girl Beyonce, we blared music throughout the room and it made the few minutes go by quick and painless. Nothing a little Yonce can’t make better. 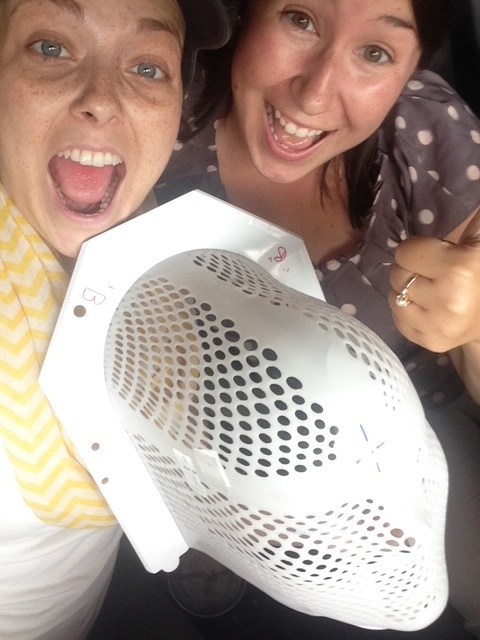 So with one of my best friend by my side, I walked out of the Brigham today with my mask in hand and am happy to say that getting my brain radiated is a thing of the PAST. WOOOOOOOOO CHIL’! And then we have tomorrow. It will be another long, hard day but at the end of it I get another milestone under my belt. Completion of the CNS (central nervous system) phase. I will receive more chemotherapy and then one final spinal tap (this is the fourth in a two week period). But as long as everything goes as planned, this will be my last spinal tap for 18 weeks!!! That’s about as long as I’ve been going through treatment so that my friends, is a very welcome and pleasant change of pace for this young lady! Milestones are important. They symbolize progression and moving forward. 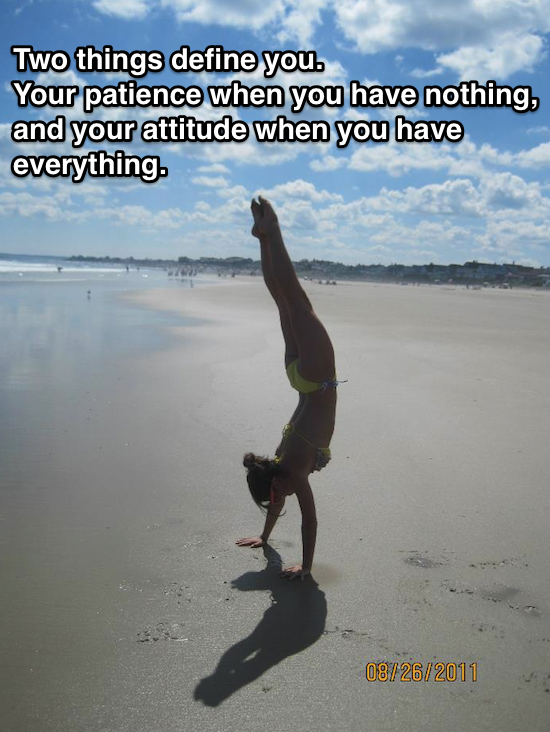 And that’s what I need right now, to keep on keepin’ on. Onward and upward: it’s what it’s all about. Foggy. You can’t see clearly. You can’t think clearly. You can’t feel clearly. Just like with fog on an ocean dock, fog inhibits you from seeing what lies ahead of you. And that’s how I feel. My whole being feels foggy. Unable to see the brightness of days that inevitably lie ahead. Bogged down by sadness and frustration; physical pain and exhaustion. Last week was hard. Really hard. This week is better but still hard. It all seems like SO much. So overwhelming. So many medications, chemotherapy and brain radiation sure has a way of making you feel out of it, making you feel not you. And that’s exactly how I’ve felt, not myself. In a way, I feel disconnected to my own life. Like I am in somebody else’s crappy body. Somebody else’s negative mind. I’m a happy person. To my core, I’m happy. I love life. I love smiling. I love laughing. I genuinely enjoy being positive. I get excited over little things. And I love that. So when I feel unhappy, when I feel like it’s an effort to smile or to laugh or to get excited, it doesn’t feel like me. And that hurts. That’s a pain that no spinal tap can replicate. As Mike and I were watching Father of the Bride 2 and Nina was just about to have the baby, she looked up at George Banks and said “Isn’t this just so amazing?” I instantly got emotional. Not because I was so moved by the film but because I felt so jealous of Nina. (she’s a character, I know.) But I felt so jealous that she was lying in a hospital bed, just like I had been all week, and that she got an incredible baby at the end of it. I want a baby, I thought. Because a baby is a miracle, a blessing. A baby truly is amazing. Now, don’t go all “omg she wants a baby?!?!? !” on me because clearly I don’t want a baby right this second but watching this character receive so much joy brought me a sense of sadness because that “amazing” feeling seems so far away. Sounds so dumpy, I know, but it’s how I felt. But then I sit here, writing that paragraph out and I know in my heart it’s not true. It’s exactly how I felt. 100% truth. Whole-heartedly how I looked at that moment. But as I reread what I write, I know that although it’s sometimes so hard to remember that there’s an end to this race, that there’s a light to the end of this tunnel, I have faith that there will be brighter, happier, fog-free days ahead. In fact, those special, amazing moments, although they may not be as obvious or glamorous as some of life’s big moments, they’re still here. Despite it all, amazing things are still happening to me. Like when a complete stranger came up to me at the Michael Buble concert on Friday and told me to be strong and that my hair would grow back more beautiful than ever. That she had “been there, done that” and that everything was going to be okay. That’s amazing. She doesn’t know me, she doesn’t know my story or my diagnosis but somehow this woman knew that I needed that little push last week. I needed to be reminded that this too shall pass. I needed a little miracle. And in that moment, my mind felt anything but foggy. It felt clear and precise and happy because I was meant to be there, finding comfort from a complete stranger. That was meant to happen to me. Now that, that’s amazing. p.s. Speaking of amazing, here are some pics from our family vacation on the Cape last week! What a Week Can Do: Part Duex. My life right now is so full of ups and downs sometimes it’s hard to keep track of. I can have a horrible week with an unexpected stay at the hospital and then a few days later I’m feeling better and enjoying the little things in life. And then there are weeks like last, that I spent with my whole family, in one of my favorite places in the world (The Cape) and enjoyed lots of relaxing, swimming, good food, laughs and love. It was the perfect week. 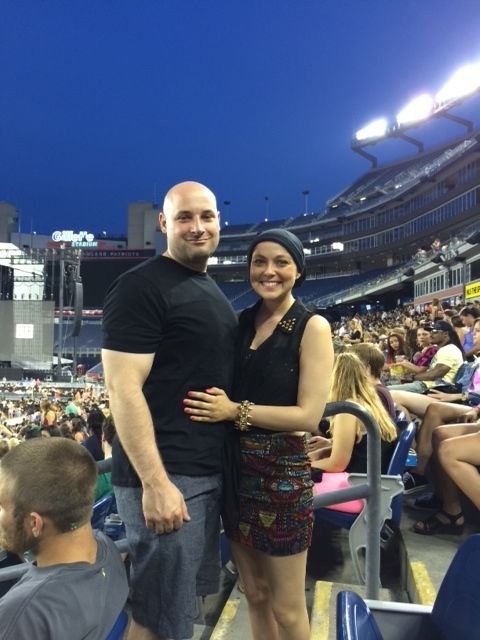 Not to mention, on Tuesday, my girl Bey was in town so I was able to head off to Foxborough and act as though I was one of her back-up dancers for 3 hours. It was three of the best hours I’ve had in quite some time. Pure happiness. I’ve been blessed to attend a lot of concerts/shows in my life, but I’ve never felt such gratitude and gratefulness for being able to attend one as I did last Tuesday night. As corny as it is, Beyonce is my idol. I love what she represents, I love the way she presents herself and above all I love her music. Her music (Halo in particular) has gotten me through a lot of crappy times in the past few months, many spinal taps, bone marrow biopsies and currently some brain radiation. So to be able to be right there with her hearing her sing the songs that I’ve listened to on repeat over and over again was magical. Being in Gillette Stadium, I was able to look up and see hundreds of beautiful stars fill the sky and at that moment I was reminded yet again of just how lucky I am. Not everybody in my situation would have been able to see their idol that night. Not everybody in general is blessed to go to shows and see live music and for that I’m so lucky. Because good music heals the soul and that’s just what it did to me that night. 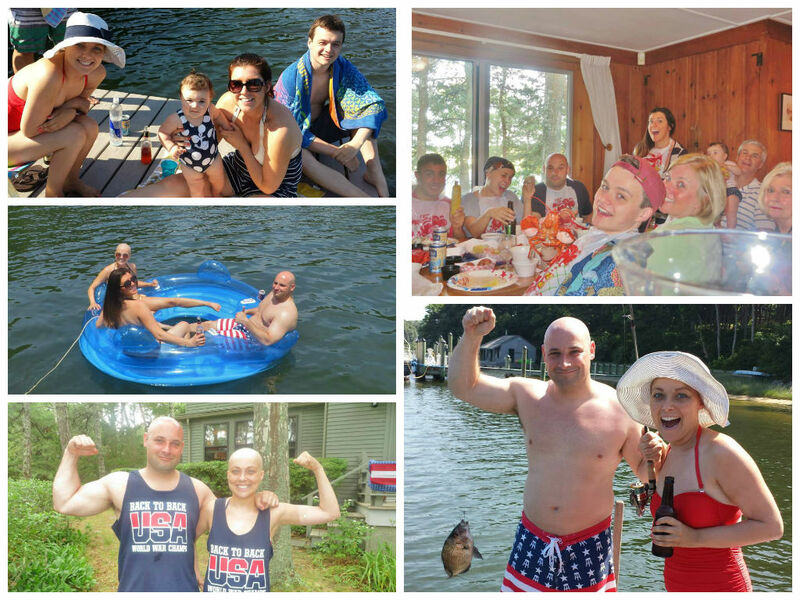 Then I got back to the Cape house, unleashed havoc on my family of how amazing my night was and tossed on one of our two matching ‘Merica/Barstool t-shirts that had been specifically ordered for the 4th. 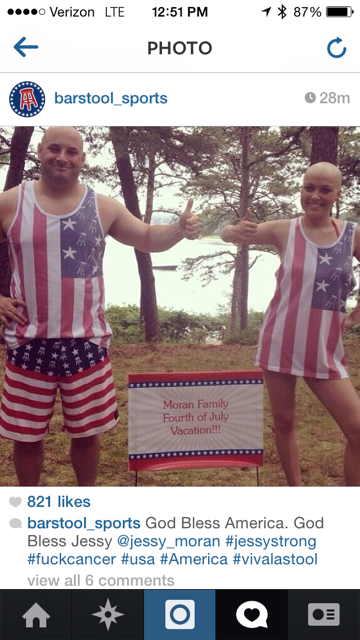 To my shock, on the fourth my favorite blog of all time, Barstool Sports, reposted my insta pic. Don’t care how dorky this makes me but I’ve been a Stoolie since 09 and I couldn’t have been prouder or more excited to be featured on their page. Highlight of the summer for sure. Today, I’m sitting in bed for as long as I can before it’s back to the Dana Farber Country Club. It’s been a long two days for sure and the following two weeks won’t be much better. Every time a vacation or holiday comes to a close, I’ve always been one to be super sad about it being “over.” When I was little, December 26th was practically a mourning day in our home. I get so amped up for things, sometimes it’s hard to come “off” the high. So as I entered the workforce a few years ago that certainly did not change, and anytime a long weekend came to a close or a vacation week ended, I found myself whining and feeling sorry that I had to get back to “the grind” the next day. Well, let me tell you, there’s nothing a good perspective can’t alter. This Sunday, there was nothing more that I wanted than to be getting up in the morning and heading off to my little cube land. Instead, I started my morning at 745 am getting blood drawn and an IV put in. After meeting with my doctors, I was given my first dose of the next round of my chemo cocktail, followed by a spinal tap, and my first round of brain radiation. Phew, it’s almost over. Oh wait, there’s more. I was then taken over to the Brigham where after almost 4 hours of waiting and no food or water in my system since 7am, I was taken into surgery to get my Port put in. (A “port” is a permanent IV line that goes in my chest and will administer all my blood work/chemo/meidince going forward). My mind has a way of ‘owning’ me so during the surgery I continued to wake up and ask the doctors if everything was going okay. No bueno. With that, they continued to pump me with more and more medicine to get me to continue to sleep. All in all, lots of drugs in one little person’s body = a lot of throwing up for the hours and day afterwards. After getting more radiation, fluids and anti nausea medicine yesterday, I’m heading in for round 3 in a a little while. But this time, I’ll be accompanied by one of my best friends— my little Jo Jo. So for that I’m thankful. I also know that just like this time last week was better than this moment right now, two weeks from now will be better than what I’m going through right here and right now. And all in all, two weeks from today means two weeks closer to my end goal of being a happy healthy version of myself. Oh, the difference a week can always make. p.s. i hope everyone had a wonderful fourth despite the not-so-great weather! Hi all, to those of you who regularly follow my blog, I apologize for not posting for over a week! I was lucky enough to be on vacation with my whole family on the Cape! We stayed in an old house and did lots of relaxing, swimming, eating and puzzles. It was perfect! But no wifi meant not too much internet time (which really was nice actually)! Anyways, I had quite a rough day “back to work” yesterday. 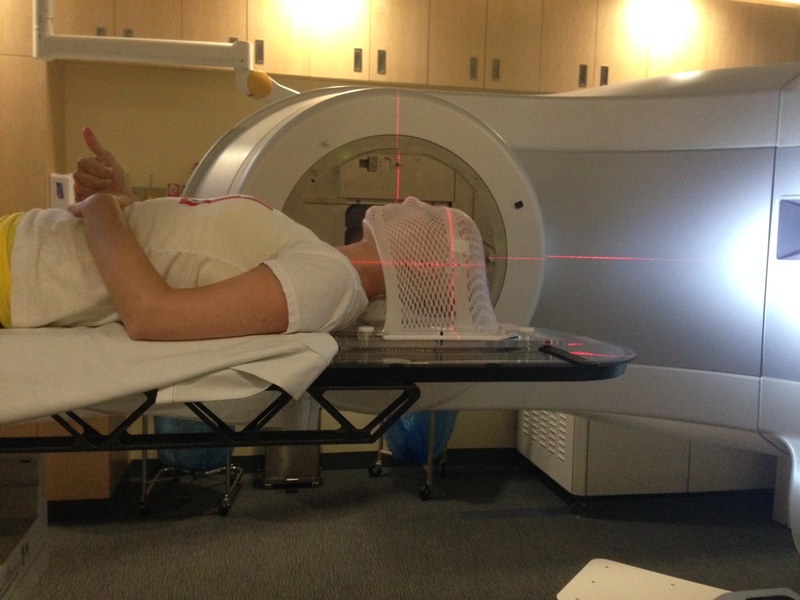 I begun my CNS phase (central nervous system) where for the next two weeks, I’ll get brain radiation, additional chemotherapy and four spinal taps to administer more chemo. In addition, yesterday I got my Port put in which will be my main IV source for the next two years! If you think I’m sassy, it comes from my brain and that did not help me last night. Throughout the procedure, I kept waking up to ask the doctors if everything was going okay so I got MUCH more medicine than my little body could handle. So today, today I was out-of-commission. Unable to keep anything down and very sore from the surgery.